What's New @ Roselle Public Library: How much electricity does your TV use? How much electricity does your TV use? 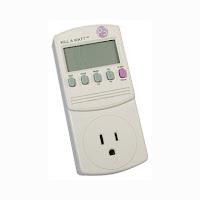 Borrow a Kill-A-Watt energy meter and find out! Roselle Public Library has four Kill-A-Watt energy meters available for check-out. Use the meters to measure how much electricity your household appliances and electronics consume. The meters are simple to use; plug the meter into a household outlet, plug your appliance or electronic device into the meter and read the screen. That's all there is to it. The meters are available through a donation from ComEd’s Smart Ideas for Your Home program. C'mon in and check one out!